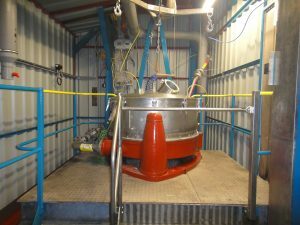 Witton Chemicals has two large stainless steel centrifuges with a capacity for approximately 150kg wet cake per spin. Material can be packed off to FIBCs, kegs or can be dried on site in one of our several dryers. All the centrifuges have the facility to enable an effective washing of the centrifuge cake. The centrifuges have full safety systems including oxygen analysers and interlocks to ensure safe operating at all times including when handling flammable materials. Witton has experience in handling large campaigns through these centrifuges of several hundred tonnes of product per annum including drying.